By Candice Clifford. Vol unteer from the Center for Courageous Kids Pediatric Pain Camp Session. CRPS Warrior. I ventured to Kentucky this past July to volunteer at the Center for Courageous Kids’ (CCK) inaugural Pediatric Pain Camp. I took a solo trip, not knowing what to expect but ready to have fun with the campers. To many, Kentucky seemed like a random place for this east coast girl to be traveling to. However, as I reflect back on my experience at CCK, there was nothing random about this trip, rather I’d like to believe it was serendipitous. Working with children who live with chronic pain and/ or illnesses is a population which is very close to my heart. I went to school for counseling, and later received a M.S. in school counseling. However, I soon realized during my last year of graduate school that I could no longer ignore my fascination with the medical field and had to follow my passion. Volunteering at CCK was my first step in making this change in my life; I went down to KY believing this experience was going to either confirm or dis-confirm my career aspirations. Needless to say, after spending four fun-filled days with the campers and their families, hearing many stories, and speaking with some amazing advocates in the field, I without a doubt knew this is the population I would advocate for. The only way to describe CCK is the “Disney of Camps”. 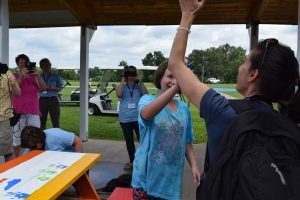 The staff goes above and beyond to accommodate the campers and their families, they generously transported me to and from the airport, and went to extreme measures to ensure that everyone had a memorable time. I could go on and on about how much I love CCK, but you really have to experience the magic to fully understand what I’m speaking about. There is something special that surrounds the campus; allowing children to be a child first, not a symptom, or a diagnosis. Camp brings families together, and creates a bond that seems to grow even when camp is over. The sky is the limit, dancing is prescribed, and it’s totally normal to be laughing one moment and crying the next. Ironically, I was also at CCK during my four year anniversary date of being diagnosed with CRPS. I’ve come along way in four years; I received both my B.S, and M.S, traveled to El Salvador on a service trip, and endured an intensive pain rehab program. Before going to camp I wasn’t very vocal about my chronic pain to the outside world. Letting people in is scary, but if there is something that someone can learn from my story then the suffering I endured was worth it. One of the biggest lessons I learned at camp, is being vocal about CRPS doesn’t mean you are making chronic pain your full story; being vocal, and advocating leads to more awareness, education,and earlier diagnosis. Needless to say a piece of my heart will forever be at CCK…You might not come home with a new diagnosis, but I promise your experience at CCK will be just as life changing. When I saw RSDSA’s fundraiser Coins for Kids, I knew I needed to do my part to help more kids experience the magic of CCK. I quickly created a Facebook Event “Candice’s Coins for Kids” and informed my family and friends about my fundraising efforts. Additionally, I shared many of the videos that were created after the pediatric pain camp to show others how their donation would impact the kids and their families. Thus far I have raised $350 (not counting change). My heart is so full of gratitude for the generosity of others and I am excited to volunteer at CCK in once again this July. Hope to see you there!